Low volume or “high mix” production products with relatively low value can result in a poor return on investment (ROI) when attempting to justify automation such as overhead conveyors. This poor ROI may necessitate the application of low cost material handling methods that employ gravity or operator assistance as the prime mover, or both. 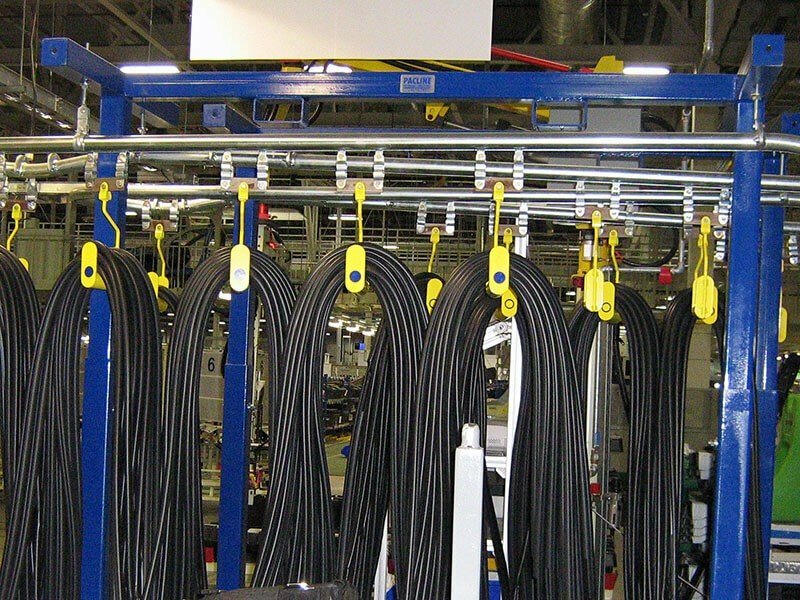 PACLINE has delivered customized systems and machines to satisfy those needs. Bolted connections on the PAC-LINE™ overhead conveyor track combined with bolt together structure means little or no welding for quick and easy installation. Enclosed track helps prevent operators’s fingers coming in contact with the moving chain. These units are quiet and virtually maintenance free. Parts accumulation or buffering between two locations. 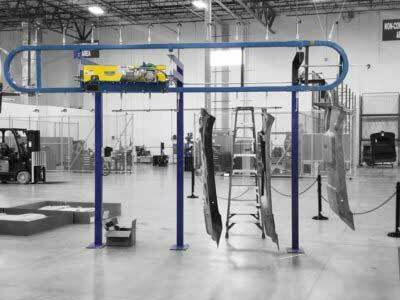 A low cost, non-powered, space saving conveying alternative for the accumulation and transfer of parts between two work stations. A conveyor chain inside the track will separate parts to a preferred distance, and allows all parts to flow at the same time. The empty return carriers travel over the top of the loop. This manual conveyor can be pushed or pulled by an operator to advance a part forward, or in some cases gravity can cause the parts to flow forward. Offers a low cost, non-powered, space saving conveying alternative for the accumulation and transfer of parts between two work stations. Instead of a chain inside the track, each part hook will be connected to a four wheel trolley inside the track. This allows each part (or empty hook/ trolley) to move independently, by gravity, from the load point to the unload point. The empty hook/ trolley can be returned to the load point by moving it around a 180 degree curve and then gravity carries it.